New picture viewer "LightBox 2" is an easy and good looking method of browsing of the pictures at our web page. It's working also with the Critical Acclaim section (press reviews). Check out new photos from Fool-X trio gig in Brodnica (November 2009). Check out the photos from the Cornelius Jazz Festival (Piotrkow Trybunalski). Check out the pictures from jaZZlot 2009 ("The pearls in the crown"). The official premiere of the book "Two handed tapping. Guitar workshop" by Adam Fulara (ABsonic 2009) will happend in the biggest Polish book store EMPiK in Wroclaw. Date: Nov 28, 2009; Time: 14.30. EMPiK "Renoma", Pl. Kosciuszki. First review of this book has been published already. Check out photos from the JaZZlot 2009 Festival. On the stage Fool-X trio with famous Polish guitar player Jacek Krolik. Check out the pictures from workshops at the JaZZlot 2009 Festival. The new module "Random picture" on main page has been added (right side). We have ca. 120 galeries from different gigs, workshops and music events. Check out new photos from Perleberg Festival 2009 (Germany). Tom Fulara plays with Be-3 project. If you want to order the book+DVD "Two-handed tapping. Guitar workshop" by Adam Fulara, check out the Buy Now site. There is safe mail order using PayPal (you can use credit card or bank account to make safe payment). The prize is 29,90 USD (another currency available too). Oct 16, 2009 - "Two-handed tapping - guitar workshop" - NEW! Check out new pictures from DVD session for the workshop book of Adam Fulara. It will be released in November 2009, and you can buy it on our web page. Check out the new pictures from gig of Be3 in "Blue Note" (Magdeburg, Germany). September 2009. 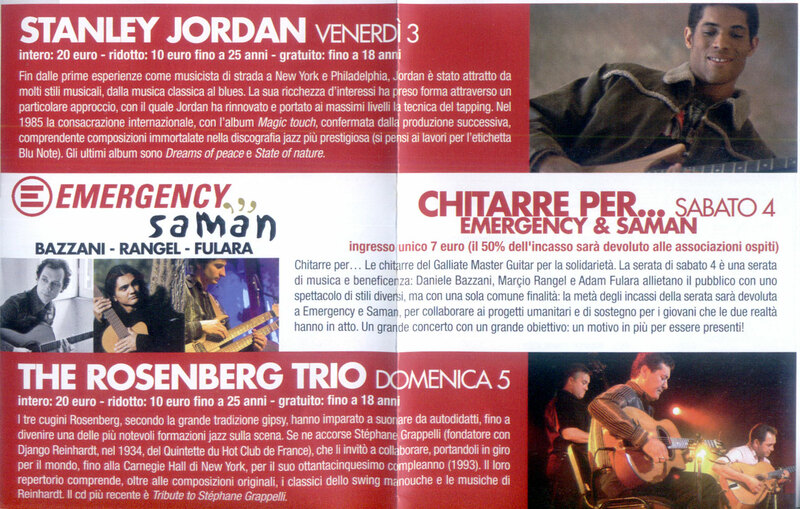 - Poster of Galliate Master Guitar Festival where plays Adam Fulara, Stanley Jordan and Rosenberg Trio (Italian). Check out new photos from gig in Libramont (Belgium) at European Tap Semminar 2009. Adam Fulara plays with Wolfgang Daiss (Germany). Check out the photos from gig of the Fool-X trio in Oswiecim. 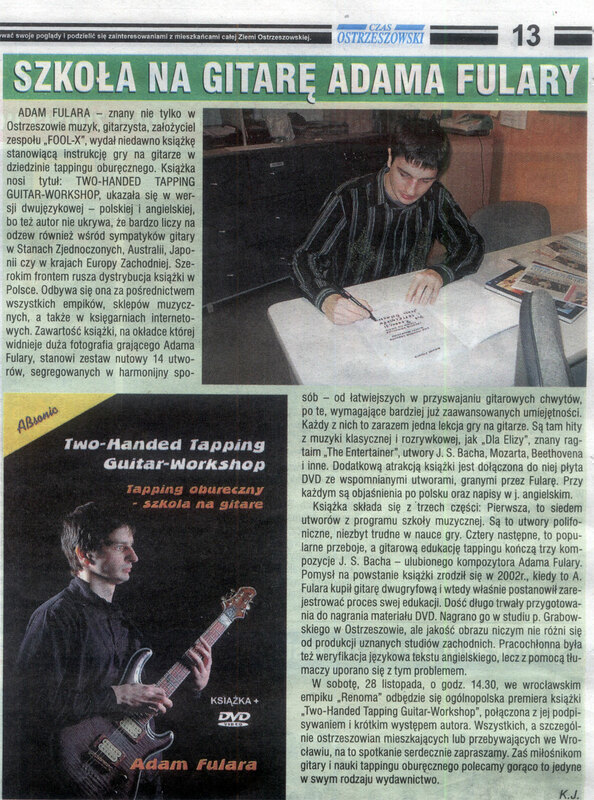 Adam Fulara has presented his new book "Two-handed tapping - guitar workshop" at the European Tap Semminar 2009 in Belgium. Check out the pictures from this event. The book will be released in October 2009. Adam Fulara has finished work on the new instructional book + DVD "Two-handed tapping - guitar workshop" (copyright by ABSonic 2009). It will be accessible in English too. The book includes 14 transcriptions of classical tunes and evergreens like "The Entertainer" and "For Elise" for 6-string guitar with standard tunning. It will be released in October 2009. Check out our web site soon. Grzegorz Kosinski is the new Polish tapper in directory. He plays bass guitar, check out links in the directory. Check out the pictures from gig of the Fool-X trio in Wetlina. Adam Fulara was one of the teachers until European Tap Semminar 2009 (Libramont, Belgium). One week of tapping workshops. Check out the pictures. Check out the photos from main stage of the Galliate Master Guitar Festival (Italy). Rosenberg trio and Stanley Jordan have performed on the festival too. Check out the pictures from the Galliate Master Guitar Festival 2009. Adam Fulara played two gigs at the festival. The gallery is from first gig, on small classical stage. Pictures from main stage (where S. Jordan and Rosenberg trio have played too) soon. Jul 31, 2009 - Adam Fulara in "Music Maker"
The "Music Maker" magazine (United Kingdom - July, August 2009) released an interview with Adam Fulara and short two-handed tapping workshops (sites 12-13). Check out the photos from gig at the XVI Festival Internacional de Guitarra de Santo Tirso (Portugal, may 2009). Tommy Emmanuel, Bob Zabek and others were performing on the festival stage. Pictures from festivals in Italy and Belgium soon. Check out the photos from gig in "Niebo" jazz club. Photos: Lukasz Kedzierski. 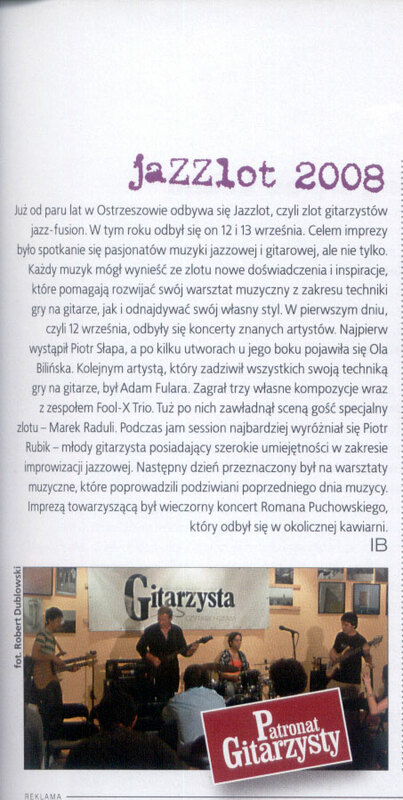 Fool-X trio will play with famous Polish guitar player Jacek Krolik on the JaZZlot Festival 2009. More info at the JaZZlot Festival site (Polish language only). Few important festivals behind. Check out the new photos from workshops at the XVI Festival Internacional de Guitarra de Santo Tirso (Portugal, may 2009). Check out the article on the blog. "Gitarzysta" released some two-handed tapping workshops by A. Fulara at the webpage. 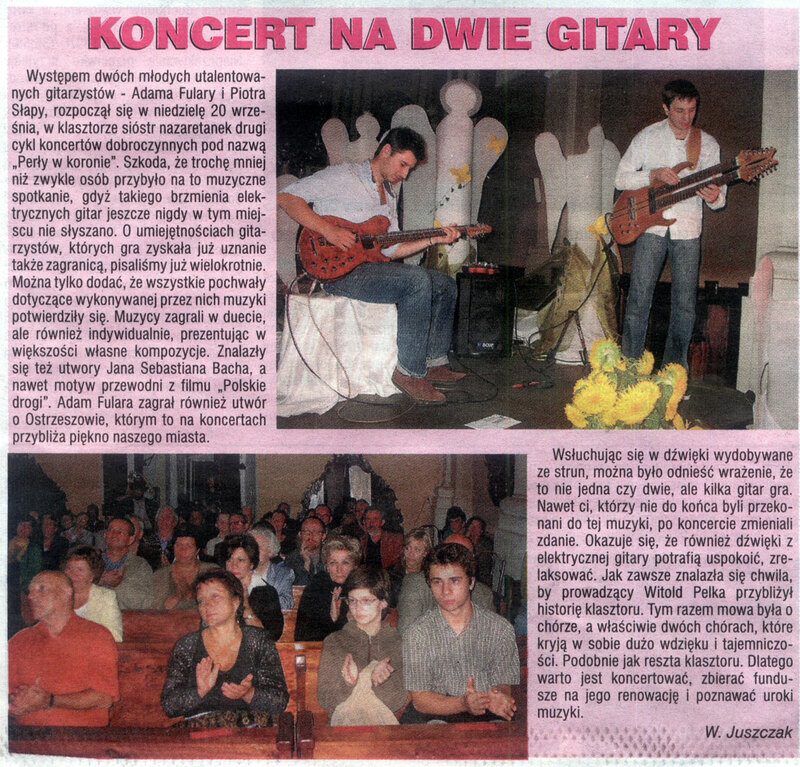 "Gitarzysta" is Polish version of the "Guitar Player". Adam Fulara is selling doublenecked Mensinger Adam Fulara signature model. Guitar it's almost new, played once, check out the pictures and details. Check out the photos from gig in Wroclaw. Check out new photos from "Creativity in Zabrze 2009", photos: David Klein. Adam & Tom Fulara uses guitar and bass WAH-WAH effects by G-LAB. Check out the Gear section. Check out the new YouTube video of Adam. Check out photos from gig in Ostrow Wlkp. Adam Fulara will play at the XVI Festival Internacional de Guitarra de Santo Tirso in Portugal (May 29, 2009). Check out the Festival page. Over 1.500.000 visits has been noticed at www.adam.fulara.com (over one milion from the U.S.A.). Refreshing excluded. Thanks for many e-mails! Check out the video with the Goldberg Variation No. 9 (J. S. Bach). Adam Fulara uses TAURUS amps. Check out the Gear section for details. Check out the new Adam's video with the Goldberg Variation No. 18 (BWV 988) composed by J. S. Bach. jaZZlot 2008 festival. Fool-X trio with famous Polish guitar player Mark Raduli.